This guy has been banned and unbanned in various formats so many times I’ve lost track and had to consult the database. Apparently he’s banned in Modern, which doesn’t really surprise me. When your deck is set up to use his dredge ability, he turns out to be so good at putting things in your graveyard that even Rest in Peace isn’t always enough to stop him. The fact that he uses +1/+1 counters lets him interact with Crowned Ceratok and Doubling Season, as if he needs any help in combat. Regeneration makes him one of the more resilient Lhurgoyf/Mortivore variants and that same dredge ability makes him even stronger if your opponent does somehow get rid of him. Speaking of which, what exactly do trolls do mechanically in Magic now that they don’t use regeneration in the new sets? Maybe indestructibility would work, but I’d love to explore some of their other roles in lore. In Old Norse, the word “troll” also has the connotation of otherworldly supernaturalness – the Faroese word “Trøllabundin” means “spellbound”, for example. They’d be a great fit for the earth-centric elements of fae magic! Out of the five cards this week, Golgari Grave-Troll is probably the most overpowered of the bunch, and it’s the only one of the five to be on a ban list (in Modern). While it enjoyed a bit of parole from the ban list some time ago, it proved itself to be too powerful to stay in the format, and so it went away again. The reason for this is dredge, which is easily among the most degenerate mechanics ever printed (alongside storm). Dredge allows you to, if you would draw a card, put a number of cards from the top of your library into the graveyard in order to put that card into your hand. The relevant thing here is that you’re putting cards into your graveyard…like Narcomoeba (which is getting a reprint in Guilds of Ravnica! ), other recursive creatures (Prized Amalgam, Vengevine, Ichorid), Bridge From Below, and spells with flashback or aftermath (or now quick-start). 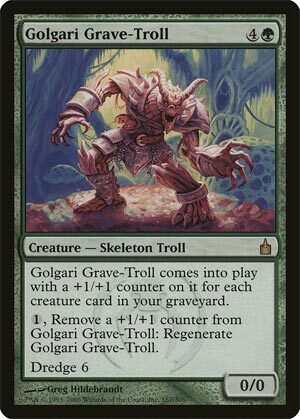 Golgari Grave-Troll has the highest dredge number printed on it, Dredge 6. That’s one-tenth of your library, which is a large amount of raw efficiency in one card. Especially if you discard it so you can do it again…and again…and again. It’s not often going to come out to play, but it’s a pretty decent creature, hard to kill and larger as you load up your graveyard. Golgari Grave-Troll is a decent card when played fairly and absolutely busted in any format where dredge is allowed to do its thing. There’s a reason it’s banned in Modern, and it’s a Legacy staple in dredge. Because while Stinkweed Imp comes close, this is the real thing.